Stimpson, W. 1851. Shells of New England; a revision of the synonymy of the testaceous mollusks of New England, with notes on their structure and their geographical and bathymetrical distribution, with figures of new species: 58 pp.+ 2 plates. ‘Barnes’ Stimpson, 1851, Shells of New England: 14. 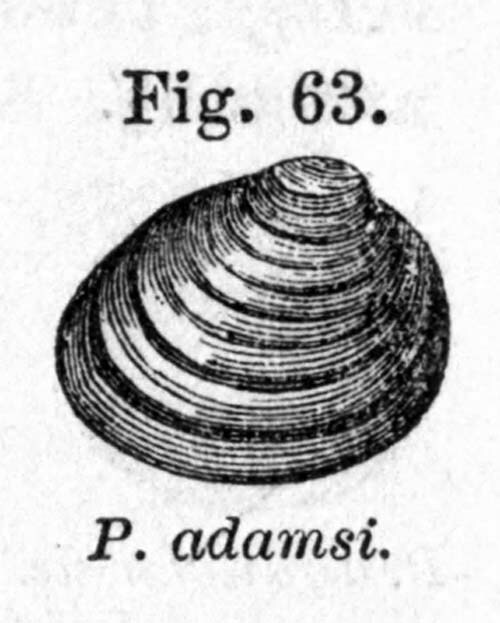 ‘Prime’ Stimpson, 1851, Shells of New England: 16. Prime, 1853, Proc. Boston Soc. Nat. Hist. : 277. Prime in Stimpson, 1851, Shells of New England: 16. Prime, 1852, Boston J. Nat. Hist. : 352, pl. 9, figs. 1-3. Prime, 1865, Smithsonian Misc. Coll. : 63, fig. 63. Stimpson, 1851, Shells of New England: 16 [nomen nudum]. Alasmidonta marginata Say. — Stimpson (1851: 15). Anodonta benedictensis (Lea). — Stimpson (1851: 15). Anodonta fluviatilis (Dill.). — Stimpson (1851: 15). Anodonta housatonica Linsley. — Stimpson (1851: 15). Anodonta implicata Say. — Stimpson (1851: 15). Anodonta marginata Say. — Stimpson (1851: 15). Anodonta subcylindracea Lea. — Stimpson (1851: 15). Complanaria alasmodontina (Barnes). — Stimpson (1851: 14). Complanaria rugosa (Barnes). — Stimpson (1851: 14). Eurynia nasuta (Say). — Stimpson (1851: 13). Eurynia praelonga (Barnes). — Stimpson (1851: 13). Lampsilis cariosa (Say). — Stimpson (1851: 14). Lampsilis ochracea (Say). — Stimpson (1851: 14). Lampsilis radiata (Gmelin). — Stimpson (1851: 13). Lampsilis siliquoidea (Barnes). — Stimpson (1851: 14). Lampsilis ventricosa (Barnes). — Stimpson (1851: 14). Margaritana arcuata (Barnes). — Stimpson (1851: 15). Metaptera alata (Say). — Stimpson (1851: 14). Metaptera gracilis (Barnes). — Stimpson (1851: 14). Strophitus sculptilis (Say). — Stimpson (1851: 15). Strophitus undulatus (Say). — Stimpson (1851: 15). Unio complanatus (Soland.). — Stimpson (1851: 13).